CLICK on any of the following photos to obtain a larger version. The primary goal of most Clans is to preserve their Scottish history and their traditions. Two objectives top their list: (1) To join Scottish festivals or organizations which provide opportunities to disseminate that information, and (2) To encourage youngsters in the Clan to learn more about their heritage. This parallels the reasoning behind the introduction of the Clan Passport. 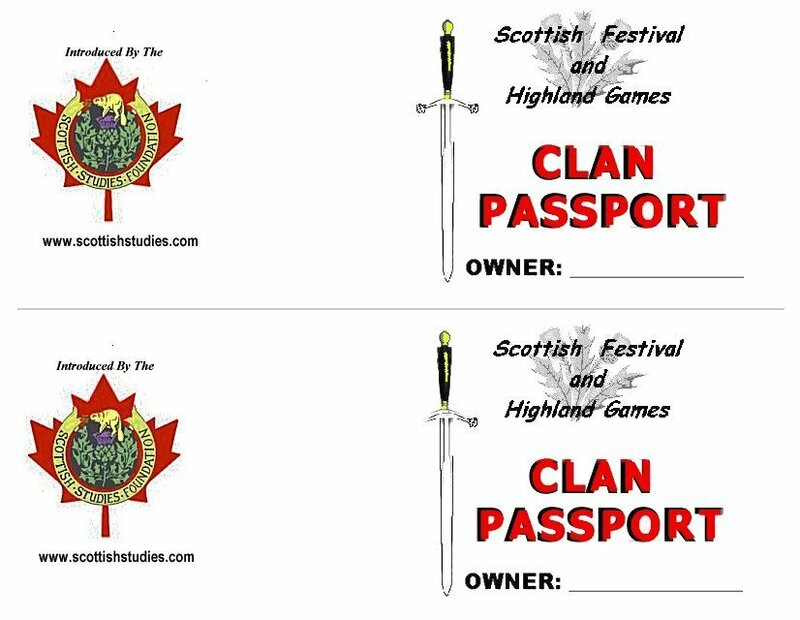 The original Clan Passport was introduced to the Fergus Scottish Festival and Highland Games in 2010 when Clan Ross, celebrating its 50th year since its founding, became the featured Clan. This first Clan Passport was designed with a space for children to print their names on the second page so that they might treasure their booklets in future years. The immediate goal was to have the children visit Clan tents to learn more about the concept of Clans and to gain some insight into their Scottish heritage. A summary of this introduction may be found at http://www.ross-ter.com/Tales/Fergus/15Fergus.html near the bottom of our report on the Fergus Scottish Festival for 2015. The Clan Passport booklets had become so successful by the sixth year that the President of the festival, who also manages the Avenue of the Clans, decided to introduce a Fergus Passport. Thus, the original Clan Passport booklets will no longer be needed there. In fact, they are bound to become collectors items worth more than the $1.00 plus tax which each one cost to have professionally printed. A new Clan Passport has been improved for general use at all Scottish festivals. The space for the youngsters to print their names has been moved to the front cover in order to promote that sense of ownership of one's heritage, and I can guarantee that none will be tossed away on festival grounds. The project is relatively inexpensive and it can start with one or two clans taking the initiative to produce a dozen or so booklets to take to the next festival. You'll be surprised how many adults will also be attracted to your tent. Users have the choice of grey scale or colour. The universal Clan Passport is not restricted to one particular festival or one particular year; if youngsters are missing a certain Clan badge, they may add it at any time and at any festival. Simply click on the following samples and save the larger sizes as JPEG files on your computer. 1. Either rotate your saved file by 90 degrees and resave it OR select "Landscape" from the Setup in your Print Preview menu. 4. Fold the covers and insert the folded pages. Make a firm crease. 5. 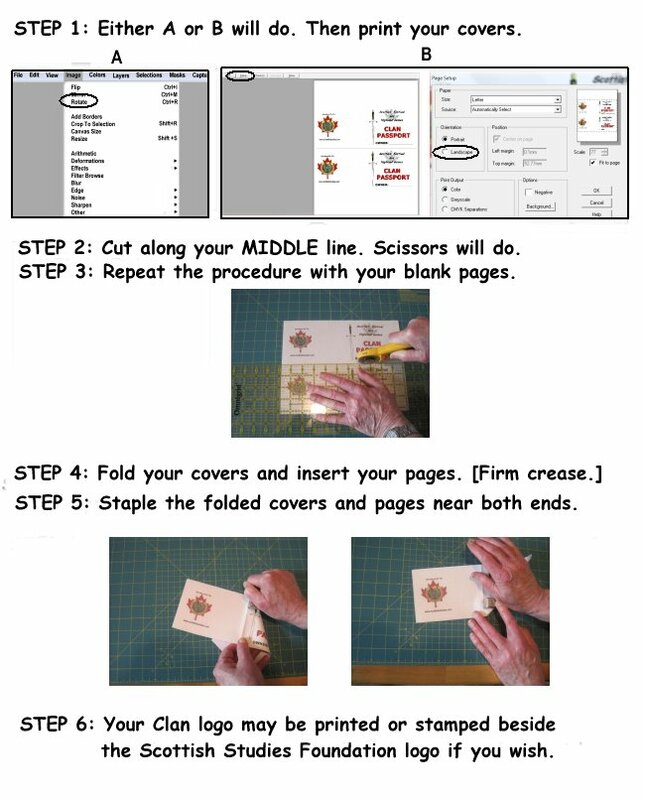 Staple the folded covers & pages near both ends of the crease. This is accomplished with a wee bit of practice. Take your booklets to your next Scottish festival, and watch the project take off! Clans that get involved with this might consider giving special offers to the Kids when they show their passport such as a special membership fee, discounts on clan merchandise, or even a free clan gift such as a bookmark. As noted in our second paragraph, the Clan Ross tent became the very first location for storage and distribution of Clan Passport booklets. The Clan representative, Andrew Ross Thibodeau, was an enthusiastic supporter of the concept from the very beginning. An illustrated summary from the Great Clan Ross website may be found HERE or HERE. The Clan Passport booklet was sponsored by the Scottish Studies Foundation in 2010 as a unique project. During its six years at the Fergus Scottish Festival, the back cover of each booklet noted the annual events run by the Foundation in support of the Scottish Studies Centre at the University of Guelph. 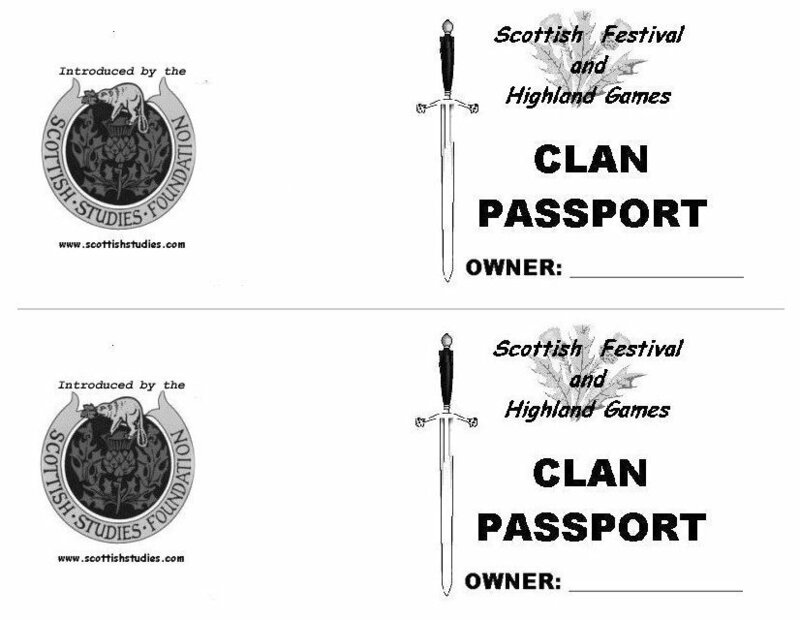 David Hunter, webmaster for the SSF, added a report about the Clan Passport booklets HERE for you to visit. At the SSF meeting on January 26, 2016, I delivered a summary of the benefits of the Universal Clan Passport. I first arrived at the Clan Campbell tent and right away spotted the Clan Passport. This idea came about as a suggestion from Doug Ross who is on the board of the Scottish Studies Foundation and the Foundation agreed to sponsor it. The idea is that the children get presented with the passport and then they need to visit as many clan tents as possible to get their passport stamped. Excellent idea! Talking to Doug Ross on the following Monday he told me there were about 495 distributed on the Saturday of which 200 went to the McKiddies Centre. A dozen each went to the seventeen clans who responded positively about having a badge-stamp (204). His wife Pat handed out 25 to places where youngsters lined up eg for ice-cream. Clan Wallace ran out of booklets and got another dozen. Doug himself handed out another 40 to youngsters without passports as they passed the Clan Ross tent. The remainder were distributed by other volunteers. None of the 495 were left at the end of Saturday. He also suggested that a story board be added to illustrate the procedure for putting together your own Clan Passport booklets. My thanks go to my friend, Alastair, for including a link in his December 4, 2015, newsletter so that the concept of a Universal Clan Passport might spread. Janette Veal of Stratford, Ontario, whose son contributed photos for the Clan Ross website, wrote, We (the family) thought your passport idea was brilliant. It certainly gets the young folk involved with the concept of clans, and, of course, the adults must go along with them (a "double-edged sword"). The kids don't stop until they have entered every last clan in the book! I have to say that the whole children's programme was excellent which is a must if you are to keep the families returning each year. There were new activities as well as some old favourites and all age ranges seem to have been covered - well done ! My interest in the Scottish Studies Foundation has been piqued - I intend to look into it further. A trip or two to the U of G Library is definitely on my agenda next month. Chris Seto, a reporter/photographer on the Guelph Mercury staff, witnessed the activity with the Clan Passport booklets in 2012, and he asked if I would add a comment for his documentary. The result is certainly worth repeating HERE! The Guelph Mercury newspaper has a lengthy reputation for involvement in Scottish events. 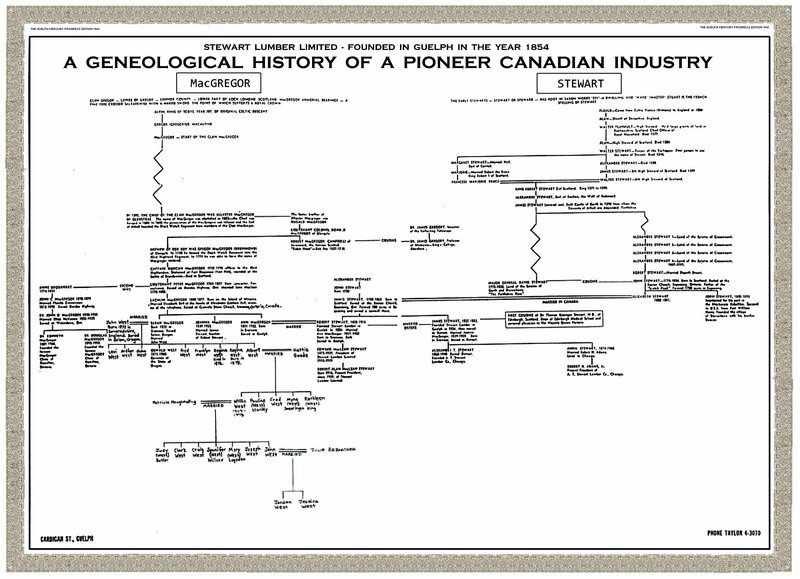 In May of 2013, John McGregor West of Portland, Oregon, USA (a fellow genealogist) sent me a copy of the Stewart Lumber Company Genealogy Chart, which his father had kept from a Guelph Mercury Progress Edition dated 1941. By the Spring of 2012, Chairman Ian Angus Munro of C.A.S.S.O.C. had observed an increase in the use of "passports" and "stamps" by the Clan representatives. We thank Alene McNeil, Editor of An Drochaid, for mailing us a copy of the May 2012 Issue in order for us to add the Chairman's comments. Our copy had disappeared from the display table at the Ross tent. 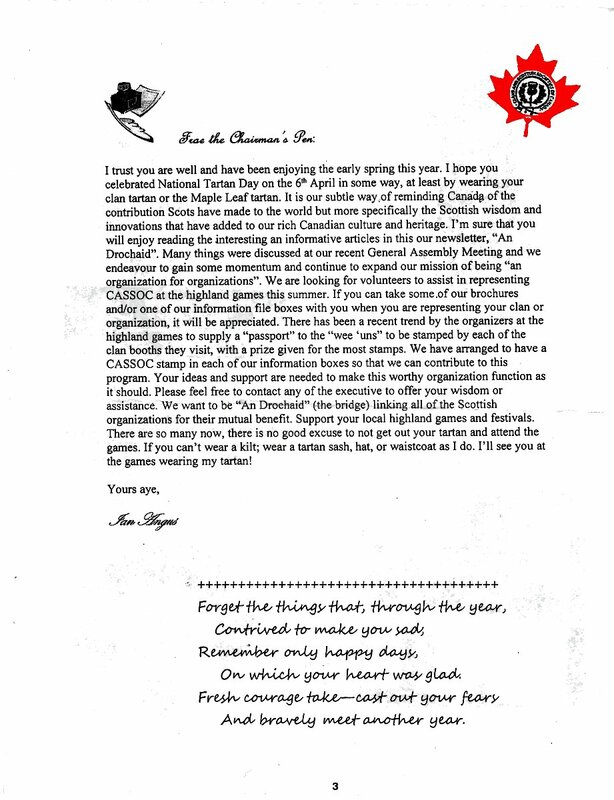 I recall that Chairman Munro's letter was also posted on the C.A.S.S.O.C. website.